I'm real excited to share about this new product which I have tried and love so much. I was invited to the LMS Spotlights bloggers' launch at Equinox and introduced to these interesting zit-zapping products. I think some of you might recall a similar product in the market previously that cost a bomb and required you to purchase new cartridges once they were used up? But not the ones I have to introduce! Babes, these amazing little gadgets actually help heal pimples without any pain at all. So are you sick of trying all those creams and gels that dry out your skin and leave brown scars behind? 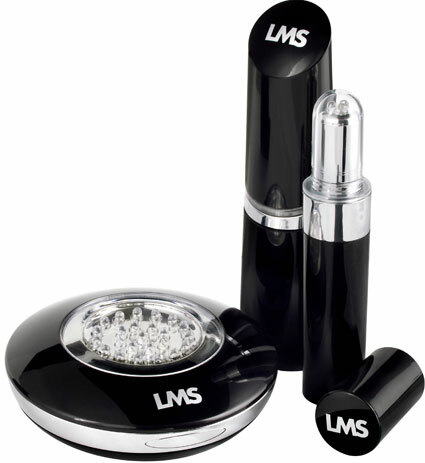 Well, fret no more because these LMS Spotlight gadgets will rid of your mild to moderate pimples away within 2-3 days. Tried and tested by yours truly! The red light you see beaming out is not invasive, does not emit heat and no, it is not laser. 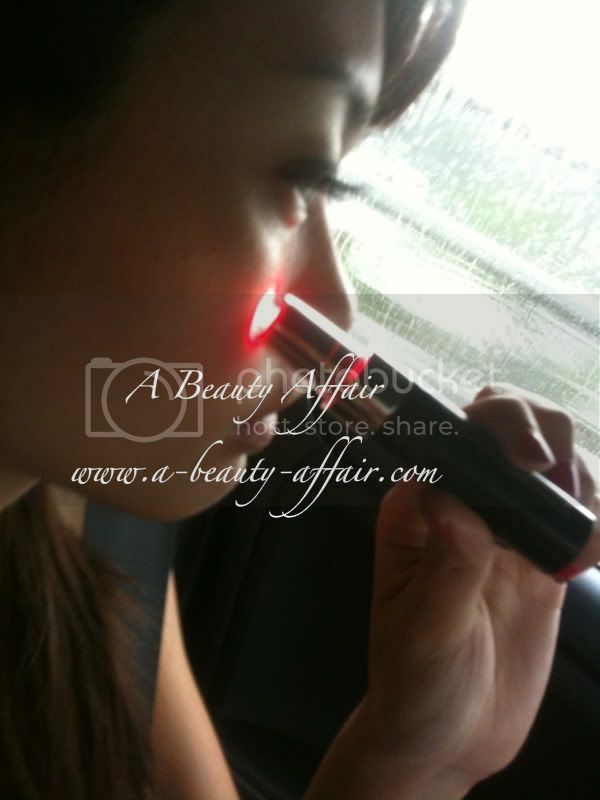 So what is red light therapy? Red light therapy using LEDs was originally developed for NASA and is a safe, natural skin treatment that is clinically proven and medically tested to treat mild to moderate acne. When skin cells are stressed, nitric oxide builds up. Nitric oxide is naturally present in cells, but when levels increase, it can inhibit the skin's natural ability to heal itself. The red light used in LMS Spotlights penetrates the skin cells to force out nitric oxide and stimulate anti-oxidants to speed up skin cell repair, helping to clear spots and mild to moderate acne, reducing redness and inflammation. LMS Spotlights work from the 1st application. On the average, you can expect your mild to moderate spots to heal twice as fast as your skin's natural healing time. 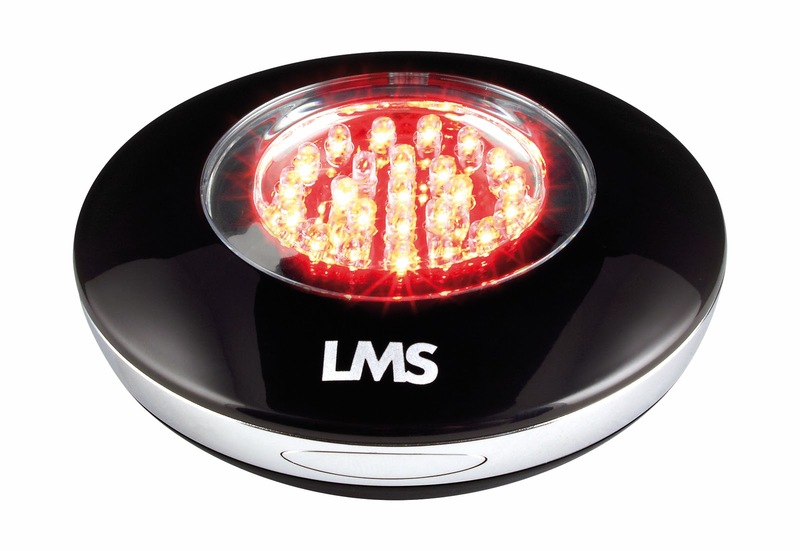 There are 3 types (sizes) of LMS Spotlights to meet each individuals' needs. This handy, subtle little spotlight 3 which is like the size of a lipgloss stick is suitable for a single spot. It should be used for 3 minutes, three times a day. 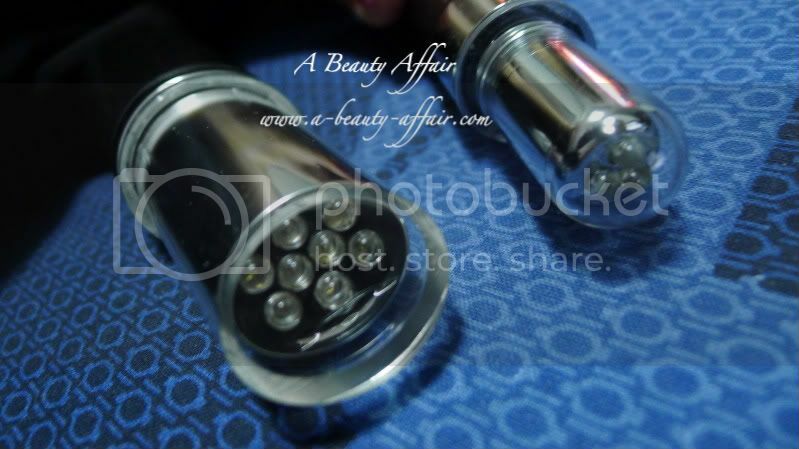 This is about the size of a mascara wand, another one that would fit in perfectly in a make up pouch. It is ideal for a small area with a few spots. Recommended usage is one minute, three times a day. Shaped like a foundation compact, this LMS Spotlight allows you to target larger skin areas. You can use this or any of the LMS Spotlights on your face or any body parts. Anywhere that has those irritating zits. Use this for one minute, three times a day. Why do I love my LMS Spotlights so much? Firstly, it works. Yes, it is as simple as it is. I had this painful zit that hurts to touch though you can't see anything there. After using my LMS Spotlight 3 for around 4-5 times for 2 days and now it's gone. 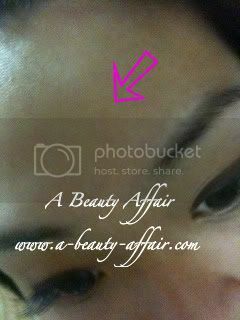 Sometimes, it is flattened but the pinkish spot lingers on for a couple of days before the zit is gone. For painful slight bumps which are not that visible, it usually just goes off in a day or two as well. 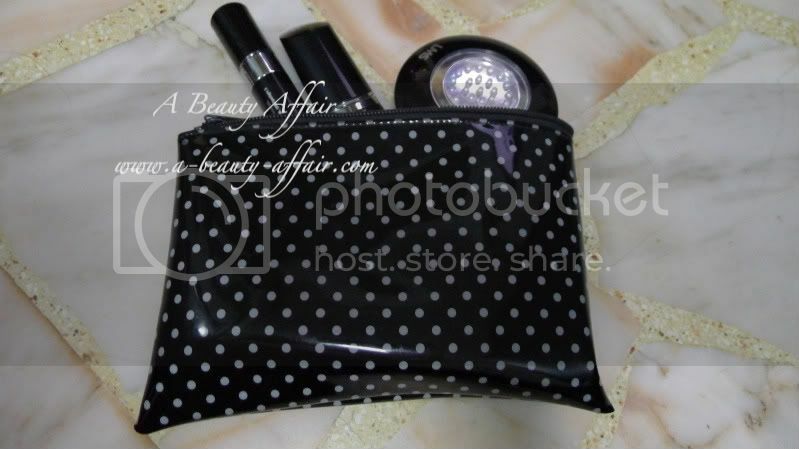 All 3 fits perfectly well into my make-up pouch. Though I prefer to bring my LMS Spotlight 8 out because I can do a quick 1 minute zap in the toilet at my own discretion. This photo shows the difference between the LMS Spotlight 8 and Spotlight 3. You can use this even if you have make up on and when you're on the go. Anywhere and anytime since it so handy and convenient to use! No wire lines or charges required since they are battery operated. Each LMS Spotlight comes a one minute timer so the light goes off once a minute is up. Therefore, for more than one minute treatments, you will need to switch it on again. This is a wonderful hassle-free feature so you won't need to use a timer or keep an eye on the clock. However, just remember not to use it within the same hour after using it for the stipulated treatment timing else it lowers the effectiveness of the red light therapy. All LMS Spotlights have medical CE Approval. It is safe and has no side effects. And no, your eyes will not hurt when you happen to look into the red light. 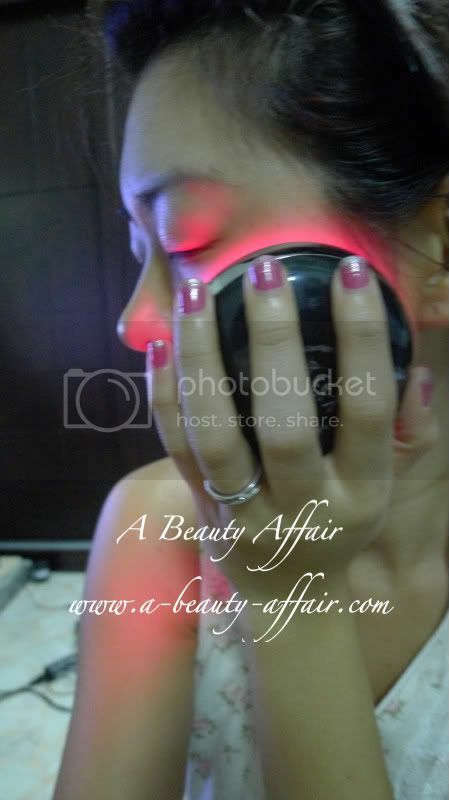 It is also affordable compared to other light therapy products in the market. This is an ingenious product which I would recommend to all! 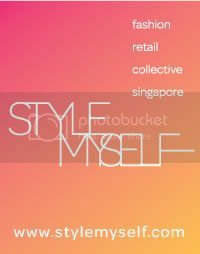 Do support the FACEBOOK PAGE too!